Very easy to use as you can see. Now lets see if we can create something interesting with this. 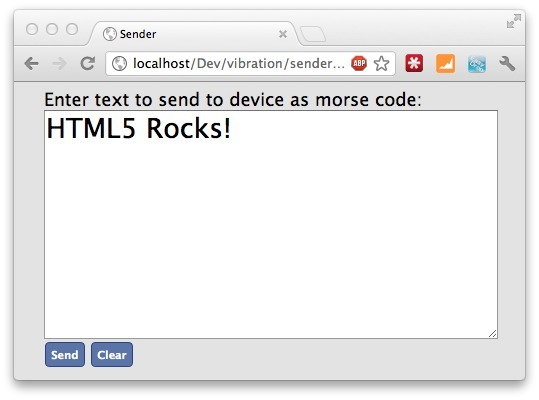 For this tutorial we’ll create a simple HTML5 application (the receiver) that can receive morse code encoded messages through a websocket and ‘play’ these messages using a device’s vibration function. We’ll also create a simple webpage (the sender) where you can enter the messages to be sent to the receiver. Note that I’ve tested this with mozilla latest mobile browser, I couldn’t find whether any of the other browser already support this API. In this video you can see that we use one browser (my tablet) to send messages. These messages are played back on the second device (my mobile phone) which runs the site in a browser. var morsecode=".... - -- .-.. .....|.-. ..- .-.. . ..."
We seperate each letter using an empty space (“ “) character and seperate each word with the pipe (“ ”) character. Looking back at the figure from wikipedia we can now convert this to a series of vibrations for our device. // we first check if the code we received is a "." // we might need to add a spacer if the next character is either a "." or a "-"
// and the current char is either a "." or a "-"
Can’t get any easier than that. When you click the button on a device that support vibration in a browser that support this API (I’ve tested with the Firefox Mobile Beta browser on Android). That handles the morse code to vibrations part. Further down in the article we’ll change this code a bit to work with websockets, but for a quick demo you can use this code. Next we’ll look at how we can connect this webapp to another one using websockets. * so that it can be used by the sender. All very trivial (more info on websockets and Play can be found in one of my previous articles here). With these routes and these actions all requests from the morse sender are immediately sent to the morse receiver. Now that we’ve got websockets that we can use to communicate between the sender and the receiver, lets look at the sender. Couldn’t be much easier! We connect to the websocket running at “ws://10.0.0.157:9000/sender”, and when we receive a message we directly pass it to the playMorseCode() function and our devices stats vibrating the supplied morse code pattern. And that’s all. As you can see in the video at the beginning of this article we can now send morse encoded messages from one web application to another where they are played back using the vibrate function of the device.